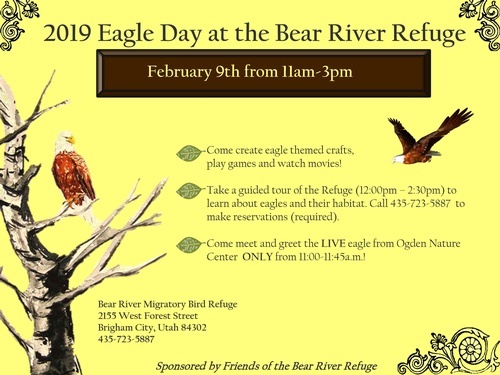 2019 Eagle Day at the Bear River Bird Refuge. Come create eagle themed crafts, play games and watch movies! Take a guided tour of the Refuge (12:00pm –2:30pm) to learn about eagles and their habitat. Call 435-723-5887 to make reservations (required). Come meet and greet the LIVE eagle from Ogden Nature Center ONLY from 11:00-11:45a.m. !